The idea of run-time type identification (RTTI) seems fairly simple at first: It lets you find the exact type of an object when you have only a reference to the base type. // Examination of the way the class loader works. 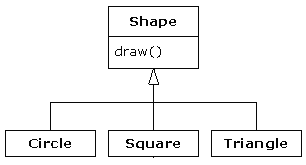 The classic cast; e.g., (Shape), which uses RTTI to make sure the cast is correct. This will throw a ClassCastException if youve performed a bad cast. // Associates keys with values. "Class name: Toy is interface? [false]"
// even if the methods are defined in the base class. Another interesting experiment is to invoke java ShowMethods java.lang.String with an extra argument of char, int, String, etc. Modify the regular expression in ShowMethods.java to additionally strip off the keywords native and final (hint: use the or operator |). Especially in the past. However, Sun has greatly improved its HTML Java documentation so that its easier to see base-class methods.